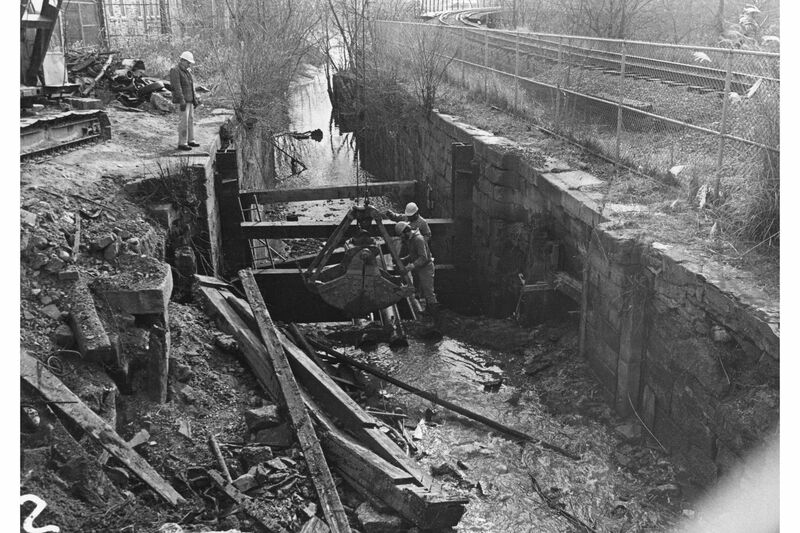 Men working on Lock 69 during a 1978-79 project to restore the canal, stabilize the lock and build a new towpath along Manayunk Canal. How would you feel if your local waterway was suddenly paved over for the use of cars and trucks? Not great? Then you’ll want to read all about how that almost happened to the Manayunk Canal, and how it was saved. It was a close one. This morning, we also have updates for you on the ACLU’s suing of Philadelphia court officials over its bail system. At issue is whether courts are evaluating defendants’ ability to pay before setting bail, as court guidelines require. The Manayunk Canal almost became the Manayunk Expressway. Here’s how it was saved. Now the Philadelphia Water Department is ready to restore water flow to the canal for the first time in a half century and Parks and Recreation plans to restore its lower locks. But the landmark’s fate wasn’t always so rosy. At one point it was nearly paved over for an expressway or a parking lot. The Pennsylvania ACLU announced Tuesday it is suing Philadelphia court officials over its bail system, claiming they do not follow court guidelines for evaluating defendants’ ability to pay. Last fall the organization sent a warning letter to court administrators claiming their bail practices are unconstitutional. A year ago, Philadelphia District Attorney Larry Krasner announced his office would no longer seek money bail for low-level crimes. Last month he said he believes the policy makes Philly safer in the long term. Al Alvarez, the former Gov. Phil Murphy administration official accused of sexual assault, appeared in public to address the controversy for the first time Tuesday. He told New Jersey lawmakers he had been falsely accused by Katie Brennan, a Murphy campaign volunteer who now works in the administration. Brennan told lawmakers in December that top Murphy aides failed to act when she told them that she had been sexually assaulted by Alvarez during the 2017 campaign. One question that wasn’t answered Tuesday: who hired Alvarez? Following the Ethiopian Airlines crash that killed 157 Sunday, customers are seeking more information about the Boeing jet that crashed. Pilots have voiced safety concerns about the 737 Max 8 to federal authorities for months. Pennsylvania has launched a criminal investigation into Sunoco Pipeline LP and its parent company over its Mariner East pipeline project, which crosses the entire state. Actresses Lori Loughlin and Felicity Huffman were among the 50 people charged by the Justice Department Tuesday in a $25 million college admissions bribery scheme. Petitions are in and Philadelphia City Councilman Bobby Henon, who was indicted in January, is the only Democrat running unopposed for a district Council seat in the May 21 primary. In a break with Senate tradition Chris Christie ally and “Bridgegate” attorney Paul Matey was confirmed to a lifetime seat on the U.S. Court of Appeals for the Third Circuit Tuesday, despite objections from New Jersey’s two Democratic senators. Contrary to myths in the neighborhood, a study of the Kensington homeless encampments closed last year has found that most of the people camping there were Philadelphians. Definitely worth the early wake-up call, @valer1ej. The Roots Picnic has announced the lineup for its 12th annual concert this summer, which will take place at a new venue: the Mann Center for the Performing Arts in Fairmount Park. Have you ever seen one of Philadelphia’s many murals covered in graffiti? No? One reader wanted to know how they stay so clean and the answer may surprise you. German grocer Lidl wants to make in-roads in Pennsylvania and is seeking grants to open six stores across the state, including some in our region. Going camping isn’t everyone’s idea of a picnic, but one local group is giving women the confidence to pitch tents and hike to their hearts’ content. “Fuentes has said that the idea was driven by residents’ concerns about quality of life, property values, and traumatizing children. It is also the latest attempt by city leaders to make Camden more palatable to outsiders at any cost.” — Camden photojournalist April Saul on the city sanitizing the truth by removing memorials for murder victims. It’s time to talk about an unspoken reason black women are more likely to die in childbirth: unconscious bias in physicians, writes Eve J. Higginbotham, M.D., vice dean for diversity and inclusion at the Perelman School of Medicine of the University of Pennsylvania. As fans deal with the ramifications of allegations of sexual abuse in the new documentary Leaving Neverland, columnist Elizabeth Wellington asks whether Philadelphia will — or even can — cancel Michael Jackson. Get moving this morning with a look back at “Caribbean World Rhythms,” a popular Philly radio show of the ’80s and ’90s, via WHYY. Finally, with his latest interview in Esquire, former Eagle (and Lululemon ambassador?) Nick Foles gives us a scandal: his Philly cheesesteak preferences. The Philadelphia Convention & Visitor’s Bureau wants to reach Chinese visitors through WeChat and Billy Penn has a look at how a scavenger hunt is helping them do it. College is difficult enough, but enrolling when you haven’t taken a math class in years? Yikes. NPR caught up with adults going back to school about the challenges they face far beyond the classroom. On a similar note, the Temple News has shone a spotlight on students with some serious time management skills: two single moms balancing classes with raising their children. Life-like statues by artist Seward Johnson stand in a lot near the intersection of 48th and Market streets in West Philadelphia on Thursday, March 7, 2019. An empty West Philly lot has suddenly found itself filled with lifelike bronze sculptures of a man reading a book, a woman sunbathing, and a hotdog vendor. But ... why?